This article seeks to explain the recent decline in Cuba’s participation rate with particular attention to the role of cyclical factors, demographic conditions, and the government’s labor market policies. The ups and downs of the participation rate. Cyclical explanations and recent mysteries. 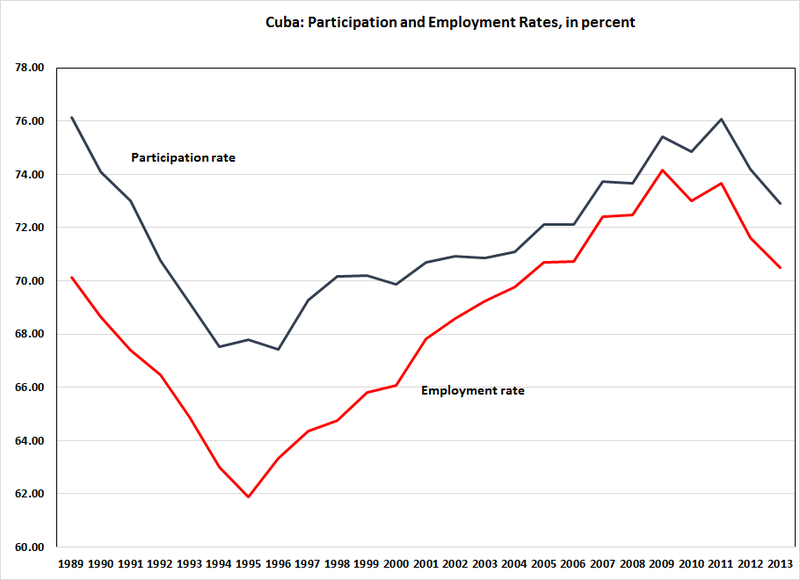 Cuba’s participation rate (the ratio of the labor force to the population of working age) fell sharply after the elimination of Soviet assistance in 1989. It then increased without interruption from 1994 to 2011 as the economy recovered. But the participation rate then fell abruptly through 2015—at least that’s what the official statistics indicate. These ups and downs are depicted in Fig.1. Both the immediate post-Soviet plunge in participation and the rapid recovery that followed had strong cyclical components. And both could be well explained by a labor-supply model relating the participation rate to the real wage rate in the state sector (including the government and the public enterprises). This dependence reflected the pecuniary incentives to join (or to move out) of the state labor force. In that model, private employment was considered exogenous as it was basically determined by government decisions concerning the areas in which the private sector was permitted to operate. But the explanatory power of the model appeared to collapse after 2012. Table 1 shows the widening forecasting error resulting from the model’s growing inability to explain the recent fall in the participation rate. 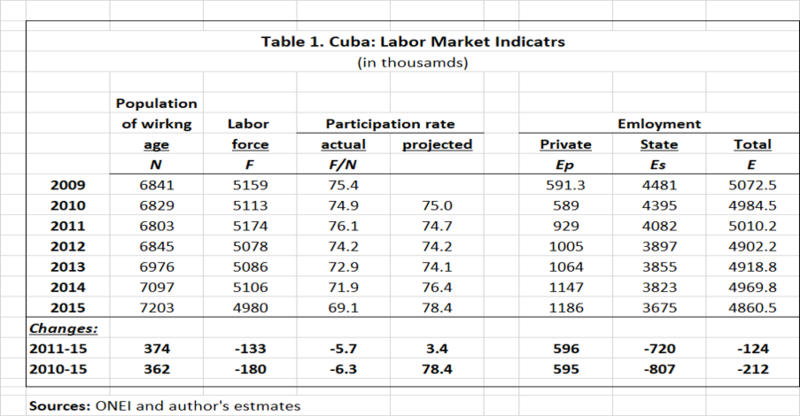 This forecasting failure reflected two extraordinary changes in the behavior of Cuba’s labor market: (i) the sudden and unexplainable surge in the population of working age; and (ii) the massive, policy-determined transfer of manpower from the state to the private sector. The weird behavior of the population of working age and the resident population. Data published by the official statistical agency, ONEI, imply that the sharp fall in the participation rate from 2011 to 2015 resulted from an alleged 374 thousand increase in the population of working age (PWA) and, to a lesser extent from a 180 thousand fall in the labor force. To some extent the surge in the PWA reflected a strong and highly unusual increase in the total resident population. In turn, this increase reflected in part a sharp turnaround—unprecedented since the 1959 revolution—from net emigration to net immigration. The precise causes of this turnaround are not known with precision, but it may have reflected the return of some Cuban–Americans from the United States, stimulated by a new Cuban law that made return migration easier, and by attempts to take advantage of U.S. Medicare and social security benefits. According to another interpretation, the surge in emigration may have reflected the return from European countries (in particular Spain) of Cuban workers who had given up the hope of finding employment in these countries. Be that as it may, the blip in the resident population accounts for only a small fraction of the rise in the PWA which to this day remains a mystery. The plan to cut state employment and its implications for the labor force. Part of the recent decline in participation can be attributed to the post -2011 fall in the labor force. Before 2011 the authorities were content to influence state employment by controlling wages, by altering the level of subsidies provided to enterprises, and, to a lesser extent, by regulating the size of private employment. But the strategy was radically altered in 2011 in response to a fundamental change in government priorities. Beginning in 2012, the administration of President Raul Castro decided to implement a completely new program that included two basic components. First it dismissed a large number of employees (correctly believed to be redundant) from the state sector. Second, it took measures to encourage the employees released from the government payroll to join the private sector. This happened in three ways: (i) private farmers were allowed to work formerly state-owned agricultural land in usufruct; (ii) the number of job categories authorized to operate privately was modestly expanded; and (iii) several regulations that had stifled the small private sector were relaxed. Because it resulted from direct government action, and because of the extraordinary size of the flows involved, the new system represented a radical break with the past. (It is therefore not surprising that a model based on historical relationships would fail to predict its impact on the labor market). The objective of the plan was to eliminate the distortions and perverse incentives created by subsidies and the resulting bulge in hidden unemployment, and thus to achieve a modest expansion in the role of the private sector and increase productivity. The plan worked smoothly in its first year of operation. As shown in Table 1, the number of state employees dropped by 313 thousand workers in 2011 and all of them were absorbed by the private sector. There was no increase in open unemployment and no massive departures from the labor force. But the plan ran into trouble afterward; the cuts in state employment continued, albeit at a much slower pace, and private employment kept growing, but not fast enough to absorb the loss of state jobs. The result was a sharp decline in labor participation. Developments in this period can be analyzed in terms of the following identity. In words, the participation rate (f) is equal to the sum of the state and private employment rates (es and ep, respectively) and the open unemployment rate (u), with lower-case letters indicating ratios to the PWA. It follows from the two equations that the employees released from the state sector must either join the private sector, become unemployed, or move out of the labor force—permanently (x) or as discouraged workers (d). As illustrated by Fig. 1, the fall in state employment in 2011 was almost exactly matched by a rise in private employment. In the next several years, however, further cuts in state employment exceeded the creation of private jobs, and this was reflected in a large outflow of workers from the labor force. In conclusion the decline the participation rate from 2011 to 2015 stemmed from two factors: (1) the unexplained surge in the population of working age; and (2) the fact that the cuts in state employment have not been fully reflected in a rise in private jobs but rather has discouraged many workers and caused them to move (at least temporarily) out of the labor force. The decline in the labor force during 2011-15 occurred in spite of a pronounced and unusual increase in real wages that should have been expected, on the basis of historical relationships, to encourage participation. Is a period of slow labor force ad private employment inevitable? Over the long term, Cuba’s declining population will inevitable reduce labor force growth. Therefore the prospects for a further expansion of productive employment hinge upon the possibility of increasing participation and achieving further transfers from public to private jobs. Why did private job creation fall short of what was needed? To some extent, the government’s backtracking on liberalization (particularly in the agricultural sector) discouraged private workers. More fundamentally, the administration’s plan simply ran out of room. From now on, further cuts in state employment will lead to further withdrawals from the labor force, unless the private sector is authorized to operate in areas that so far have been the exclusive province of the state. This would seem to face insurmountable ideological obstacles. But it need not. Here are some ideas on how to do it. Private clinics and doctors’ offices could be authorized without compromising the principle of free medical care for those who need it. Nurses and doctors could be allowed to preform house visits without government control. Private high schools and universities could be allowed while maintaining free public education for those who want it. (This may also lead to an improvement in the quality of higher education, particularly in the field of economics, although this does not need to be advertised). Teachers should be allowed to give private lessons, something that apparently is already occurring. Private consulting companies dealing with engineering, economic, legal and accounting issues should be authorized. Professional sports, particularly base-ball, could be privatized, and local clubs could be permitted to attract new investment (badly needed to upgrade crumbling facilities and improve athletes’ salaries) by reaching agreements with foreign professional clubs. And the winter base-ball leagues should be re-instated, leading to increased tourist arrivals and revenues for both clubs and governments. In conclusion, the government’s plan to reduce disguised unemployment in the state sector has been, on balance, successful. The number of redundant state sector workers has been cut by 800 thousand (14% of the labor force). Over the medium, term this should lead to a rise in productivity and improve incentives for job search. To be sure, private sector growth has not been sufficient to absorb the decline in state employment, leading to a fall in labor force participation. Therefore, further progress will require allowing private agents to operate in sectors that so far have been reserved to the state. Still, the plan has created almost 600 thousand private sector jobs, raising the private share in employment from 11.8% in 2010 to almost 24.4 % in 2015. That is definitely progress, but not enough to achieve the administration’s growth objectives. The figure also shows the ratio of employment to the population of working age. Movements in this variable are broadly similar to those in the participation rate, although they exhibit greater cyclical sensitivity. This is because the participation rate includes not only the employment rate but also the unemployment rate which is contra-cyclical. The following regression, estimated over the ´period 1989 to 2013, illustrates the basic labor supply model. F/N is the participation rate, w is the nominal wage rate in the state sector, and p is the GDP price deflator. t ratios are in parenthesis. Other equations revealed a statistically significant negative correlation between the participation rate and real per capital pension earnings, but the estimated coefficients were unstable. Separate equations estimated for a shorter time period yielded a significantly higher wage coefficient for females than for males, suggesting that women have a higher propensity to move in and out of the labor force in response to changes in real earnings. Private employment includes the self-employed, independent private farmers, the Cooperatives of Credit and Services and other private jobs. In this article, private employment is used instead of non-state employment because the latter definition includes agricultural cooperatives such as the Basic Units of Cooperative Production (UBPCs) that remain subject to substantial government control. Contrary to a frequent assertion, employment in non-agricultural cooperatives so far has remained minuscule. See “A Demographic Revolution or a Blip?”, ascecuba.org//blog. See also Roger Betancourt, “USA-Cuba Migration policy. A Political Economy View”, and E. Hernández-Catá, “Economic Relations between Cuba and the United States. From Irrational Exuberance to a Cool Shower”. Both articles are forthcoming in Cuba in Transition, Volume 27 (2018). Cuba is not the only country that has experienced a fall in its participation rate in recent years. In the United States participation declined from 67.3% in 2000 to 62.6% in 2015. Some analysist attribute this decline to demographic factors, in particular the ageing of the population. See Maria A Ariass and Paulina Restrepo-Echevarria, “Demographics Help Explain the Fall in the Labor Force Participation Rate,” The regional Economist, Federal Reserve Bank of St. Louis. October 2016. These outflows do not necessarily imply a decline in active employment as some of the former state employees may have joined the informal sector.